The disease is often painless and presents no symptoms. Many times, osteoporosis is not discovered until weakened bones cause painful fractures in the back, wrist or hips. 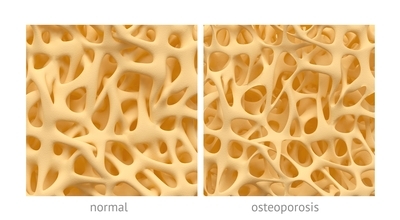 Adults actually start to develop osteoporosis after total bone mass has peaked—around age 35. In women, the rate of bone loss speeds up after menopause, when estrogen levels fall. Dr. Davis undergraduate degree was in anthropology, and he always had an interest in native and aboriginal foods and lifestyle which generally led to native peoples having extremely strong bone structures (unless there was protein/calorie malnutrition.) There is one obvious factor in modern times that destroys bone density that was not present in traditional societies – the ever present “soft drink” – a bone’s worst enemy. Why? Commercial soft drinks just wouldn’t taste so “refreshing” if one removed the phosphoric acid. That acid strips calcium from the bones, and limited studies have already shown that. You might just imagine that Coca Cola, Pepsi Cola, and other soft drink giants would not support such research! “In a large, well-designed study published by Tucker and colleagues in the American Journal of Clinical Nutrition in 2006, women enrolled in the ongoing Framingham Osteoporosis Study who drank just three or more colas a week had a 3.7% to 5.4% lower bone mineral density in their hip bones when compared with women who didn’t drink the beverage. The study also showed what scientists call a dose response: The more soda participants drank, the lower their bone mineral density. The effect was seen only with colas — non-cola soft drinks, such as ginger ale and orange soda, had no effect on bone density. That finding led Tucker and colleagues to suggest that the phosphoric acid in cola is behind its bone-weakening effects. There are numerous herbs including nettles and comfrey leaf that have the reputation of supporting healthy bone renewal which would stave off osteoporosis. Dr. Davis’ dietary coaching especially addresses nutritional factors to help prevent osteoporosis and to delay its onset.